Theater has the power to help us better understand ourselves as well as others, whether it’s people from diverse cultures or anyone who is different than us. So it’s no surprise that New Paradigm Theatre (NPT), a company renowned for its imaginative productions that embrace diversity, will present another show with a poignant and timely social message. Coming on the heels of its sold-out shows of Oliver! 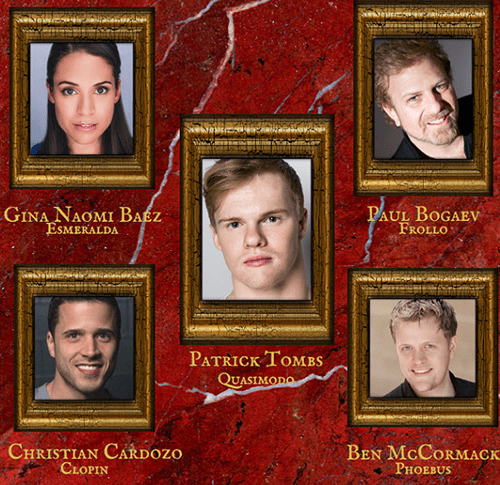 Reinvented in 2016 and last year’s Peter Pan, the company will present The Hunchback of Notre Dame Aug. 18-19 at the Fairfield Theater Company. NPT’s mission is to bridge the gap between arts and the community by creating shows that celebrate diversity in cultures, ages, and gender in its casting. New Paradigm always partners with a community non-profit to echo the theme of the show. The Connecticut Burns Care Foundation was chosen to partner for Hunchback and several of the children there may appear in the show. In its application letter for the partnership, the Burn Center likened children who have been burned to Quasimodo’s character, saying both are treated like outcasts. Actor Patrick Tombs who plays Quasimodo is a perfect example of how New Paradigm has such inventive casting. Playing the role of a disabled character, Tombs was born with arthrogryposis, a birth disorder that causes an infant to have atrophied muscles and stiff limbs. “It is my hope that we see more ‘abled’ people represented in the arts, but that only starts by us reclaiming those roles that fit our body features,” he said. The Disney version of Hunchback was one of his favorite movies growing up. “I loved the music, and I felt a connection with Quasimodo because of his body differences,” Tombs said. Huffman. “We love the shows we chose so far because we can use young people from the area.” Hunchback and the company’s previous shows use a mix of Broadway professionals with community actors of all ages. “This year we have three to four kids with special needs in the show; we wanted to make sure it’s about all abilities, not just kids with tons of experience. We are looking for inclusivity across the board,” she said. The show features performers from a variety of cultural backgrounds and the cast ranges in age from 8 to 75 years old. The role of Frollo, the villain, will be played by Emmy and Oscar winner Paul Bogaev, who is also serving as the musical producer. TV and stage veterans Scott Bryce and Jodi Stevens will co-direct the show. While two of the show’s leads are men and Hunchback is seen as a male-centric show, NPT has a strong core of women working on and off the stage. 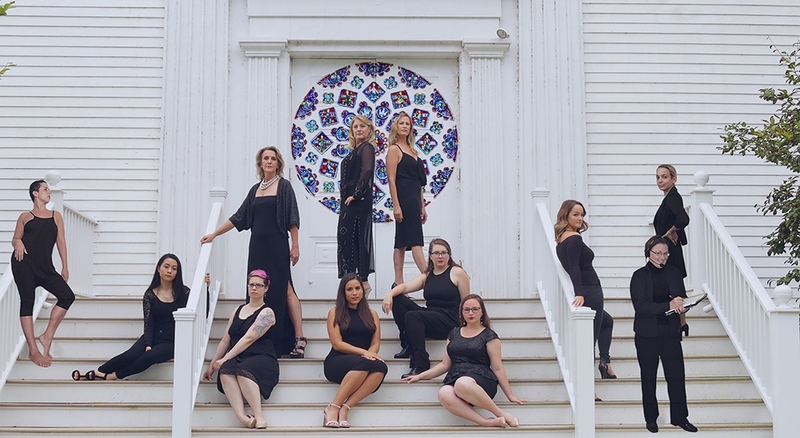 With a female-dominated production team, and a talented leading lady (Gina Naomi Baez, playing Esmeralda), this group of women is redefining women’s roles in Hunchback to tell a story of love and hope. Besides Huffman, Baez and Stevens, the group of women includes choreographer Maria Cheniscki, lighting designer Elizabeth Stewart, stage manager Erin Joy Swank, assistant stage manager Sage Frasilli, costumes and props designer Sarah Korn, NPT Youth Board presidents Julia Levine and Marie Fulde; interns Katherine Griffin, Jennifer Beveridge, Anna Martinsky and NPT treasurer Lynn Vetare. The women behind The Hunchback left to right: Choreographer Maria Cherniske, NPT Youth Board President Julia Levine, Costume Designer Sarah Korn, Exec Dir of CT Burns Care Foundation Kathlene Gerrity, Leading lady Esmeralda played by Gina Naomi Baez, NPT Artistic Director Kristin Huffman, Hunchback Co-Director Jodi Stevens, marketing intern Anna Martinsky company manger intern Katherine Griffin, directing intern Jennifer Beveridge, Stage Manager Erin Joy Swank, Lighting Designer Elizabeth M. Stewart. Photo by Mark Holleran. Special effects by Chloe Glenn. “As an artistic director who is female and has been in this business 25 years, we are a minority as ADs,” Huffman said, adding that she realizes it is up to women to hire not only the best person for the job but to work hard at opening up these opportunities to women. Given the polarized socio-political climate today in the country, Huffman hopes the show’s message resonates with the audience. “New Paradigm is a theatre with a social conscience. We produce events and shows that not only entertain with Broadway pros but that also connect directly to our community,” she said. For information visit, nptheatre.org or boxoffice.fairfieldtheatre.org.